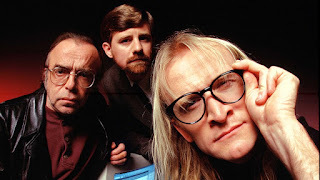 The Lone Gunmen were always favourite extras of mine. I know that this episode is not a fan favourite but I was glad they got some kind of a send off. Of course the title says it all. This is a hokey bit of apocalypse/saving the world but kitsch is appropriate for our three amigos. I never watched their spin off but this episode worked for me anyway. I spent a bit of time trying to get things straight but really this was just about finding an ending for Byers, Frohike and Langley. I liked Jimmy, the intern and Harlow, the femme fatale well enough. I could imagine the 'guys' spending all their money to find one of their own. Fletcher was an appropriate catalyst for the episode and he was his always sleazy self. I thought the scam he ran was clever enough. He had some really good lines though I wasn't keen on the way that the Lone Gunmen were slagged throughout. My favourite thing about the Gunmen was that they were just regular guys who had a calling and did what they thought was right. Langley's defense of Joey Ramone said it all. They weren't trained spies or super heroes. They were the nerds next door and they never quit. The apocalyptic plot was weak but interesting. Sharks are pretty cool and the fact that they have a fantastic immune system is intriguing. I just didn't get why the bioluminescence and why the professors would be happy to kill themselves when they probably could have just planted viruses in shark cartilage without sewing them inside themselves. A briefcase might have sufficed. Also I've never been to a conference where there were metal detectors. I don't know, maybe bioethicists are a rowdy bunch. However, it worked well enough as a vehicle for the Lone Gunmen to sacrifice themselves and become heroes. I just hope all those doors off to the side were airtight. Jimmy the hacker was a bit of a jerk. Guess we needed him to know the boys were broke. I'm just not sure why they needed to be broke. I now know that there should always be two men if you want to release a deadly virus. Just in case. Different anagrams of Lee Harvey Oswald – Yves Adele Harlow. I couldn't think of any more but I bet someone else has. Of course the Gunmen had a secret door. Fletcher: “But the world is not kind to idealists and those who fight the good fight don’t always win." Fletcher: "This place is like 'How the Grinch Stole Radio Shack'." And here's me being annoying and saying, only four more to go! I still don't believe they're gone. And I wouldn't be surprised at all if they turn up alive and well during X-FILES season 11!